Social media accounts with huge associated audiences are lying dormant. Examples like @London2012’s Twitter account could be repurposed to make the most of these assets. So, the Olympics are over for another four years. Having gorged myself on the heroics of TeamGB, I’m personally suffering from withdrawl. TeamGB’s social media team also did a sterling job over the two weeks, sharing content about our athletes’ magnificent performances. Their two primary platforms based on fans and followers were Facebook and Twitter. Their Twitter account has an impressive 822,000 followers. But there’s another relevant Twitter account with an even larger audience, and it’s dormant. This account has 1.32 million followers. It’s tweeted seven times since the end of the Paralympics in 2012, the last in July 2013. Will this account and its audience of 1.3 million potentially sport mad followers just sit and fester forever? And it isn’t just the number of followers that’s impressive, it’s the quality too. @coldplay, @WayneRooney, @idriselba, @astonmartin, @thetimes, @Harrods, @EvanHD, @cabinetofficeuk, @WomensRunning, @KathViner and @andyburnhammp. The identity shouldn’t get in the way of using it. 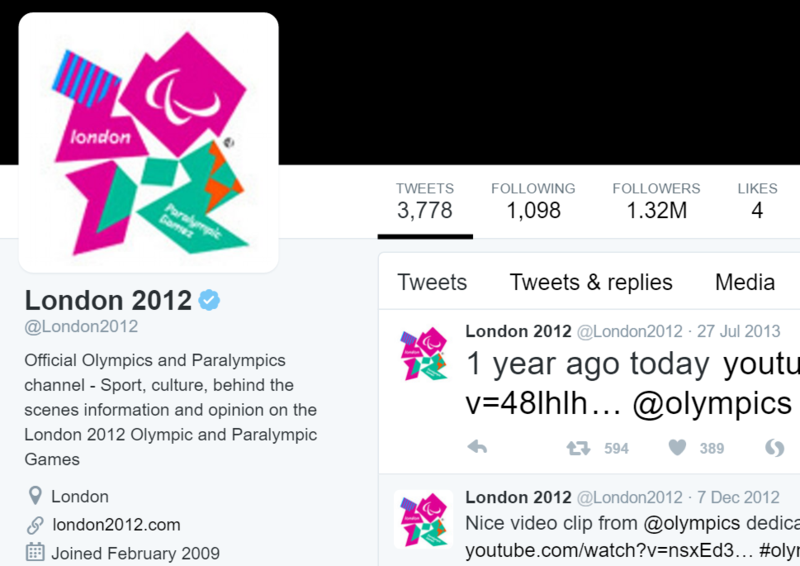 Behind every account is a unique TwitterId (it’s 19900778 in @London2012’s case if you’re interested). This means you can change your @username and still maintain your follower and following relationships. Here are the Twitter instructions to do this. I don’t know who “owns” this asset, but surely whoever it is could think of a change of identity that would still be relevant to the majority of its followers. Perhaps it could have been used to support the Games’ legacy? @UK_Sport’s 91,400 followers rather pales in comparison. And @London2012 isn’t the only account like this. What are the BBC going to do with accounts relating to shows that are no more, like @BBCTheVoiceUK and its 521,000 followers, or the @ChrisMoylesShow with 518,000? Nothing by the looks of it. 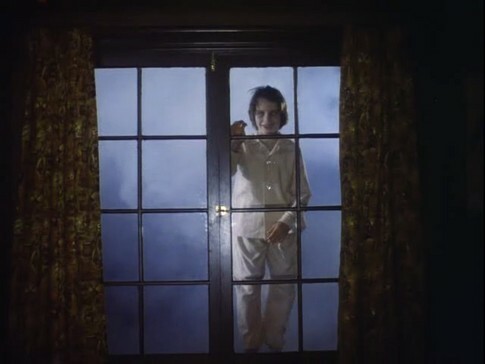 On a sombre note, there are accounts that become dormant because someone dies. Examples like @ebertchicago and @davidbowiereal demonstrate that even then there can be circumstances where it’s appropriate for the accounts to live on. As of writing Lissted‘s data shows 28,401 accounts with 10,000+ followers who haven’t tweeted in the last 90 days. Not all of these accounts will be dormant. Some like Ed Sheeran may be just “buggering off for a bit“. But many will. Between them they have a combined untapped group of 1.5 trillion followers. Now there’s a number worthy of a gold medal! 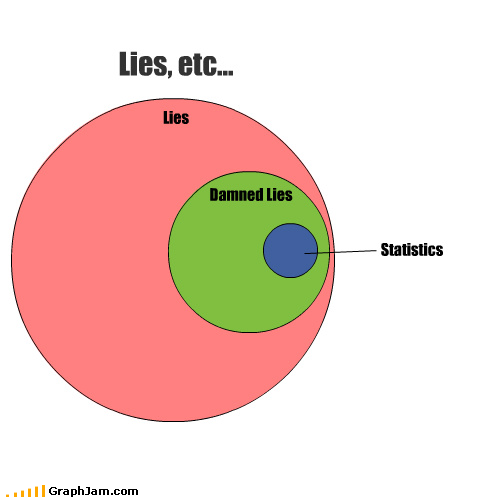 It’s important to understand the full context relating to social media statistics before you act on them. 91 per cent of mentions [on social media] come from people with fewer than 500 followers. When it comes to your social media strategy, don’t discount the importance of brand mentions by Twitter users with low follower counts. Follower numbers shouldn’t be the be all and end all when it comes to defining your social media strategy. Agreed. For a start, where influence is concerned, relevance, proximity, context and other factors are crucial. And followers is a very simplistic metric and depending on how they use social platforms, may have little in common with a person’s real potential for influence. Also, even if the mention itself doesn’t influence anyone, simply the knowledge that an individual has shown an interest in your brand in some way is potentially of value. But while sympathising with the inference drawn, I think the statistic and its underlying data would benefit from some numerical context to better understand their implications. N.B. I’ve focussed on Twitter in this analysis as that’s where the majority of the data in the particular research apparently came from. – Low Follower Group – Less than 500 followers. – High Follower Group – 500 or more followers. And then let’s look at two relevant areas – Impressions and Retweets. Who could have seen brand mentions by each of these groups and potentially been influenced by them? – Average number of followers. I used this estimated distribution of follower numbers across Twitter users*, combined with Lissted‘s data on nearly 2 million of the most influential accounts, to calculate a weighted average of the number of followers each group is likely to have. Every time you tweet only a proportion of your followers will actually see it. For many users this proportion could be less than ten per cent. The “impression rate” represents the total number of impressions generated by your tweet, divided by your follower number. It only includes impressions on specific Twitter platforms – web, iOS app and Android app. This means impressions in applications like Hootsuite and Tweetdeck don’t count. The rate is also complicated by retweets. The rate calculated by Twitter Analytics includes impressions that were actually seen by followers of the retweeting account, who may not follow you. I’ve tried to look at retweets separately below, so for the purpose of this analysis I’m looking for impression rates without the benefit of retweet amplification. On this basis I’ve assumed an impression rate of ten per cent for the Low Follower Group and five per cent for the High Follower Group. These assumptions are based on various articles estimating impression rates in the range of 2-10%. For the sake of prudence I’ve used a lower rate for High Follower accounts on the assumption that they could have a higher proportion of inactive and spam followers. Finding: only 19 per cent of impressions relate to the Low Follower Group. Quite simply the difference in reach of the High Follower accounts (84x higher – 8,400 v 100) more than offsets the difference in volume of mentions by the Low Follower Group (only 10x higher – 910 v 90). 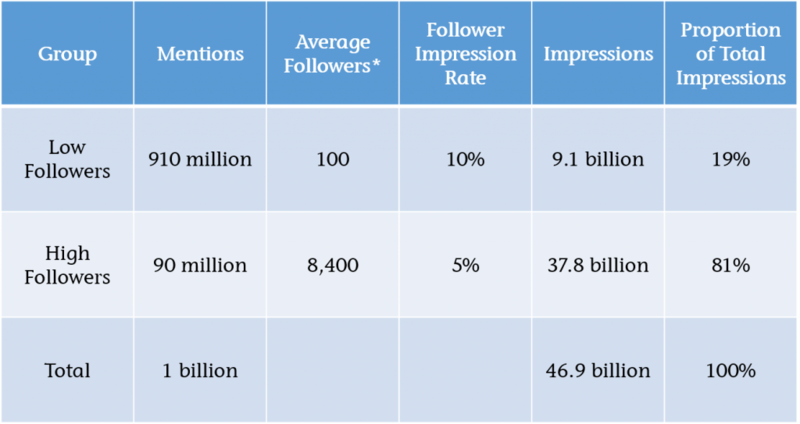 For the Low Follower Group to even represent 50 per cent of the total impressions we’d need to assume an impressions rate for this group that is over 8x higher than for the High Follower Group e.g. 42% v 5%. Though I suspect there may be a difference, is it really likely to be that much? Next we need to consider if any of the brand mentions were retweets. If so were the original tweets more likely to be by accounts with high or low followers? A lot of retweets by volume are by accounts with low followers. That’s just common sense because the vast majority of Twitter users have low follower numbers. But when we’re exposed to a retweet it’s the original tweet that we’re exposed to. This is the very reason why Twitter includes the resulting impressions in the Impression rate (I’m assuming automatic retweets, not manual ones). To understand this better I analysed a sample of over six million tweets tracked by Lissted over the last two months that were retweeted at least once. The sample included tweets by 1.27 million different accounts and collectively these tweets received over 200 million retweets in total. Of these six million tweets, 0.6% of them (c.39,000) accounted for two thirds of the total retweets generated. And 99 per cent of these “top tweets” were by users with 500+ followers. Finding: a high proportion of retweets are of users with High Followers, even if many are by users with Low Followers. – generate the majority of any resulting retweets. In other words it’s high follower accounts that are more likely to be the source of the majority of the brand mentions that people are exposed to on Twitter. As I said at the start the purpose of this analysis is simply to give some proper context to an isolated statistic. Assessing the impact and actions you should take due to mentions of your brand requires consideration of a lot more factors than simply numerical exposure. It could be the case that high follower tweets make up the vast majority of the mentions people are exposed to, but factors like trust, context, proximity and relevance could lead to mentions by low followers having more influence on business outcomes. 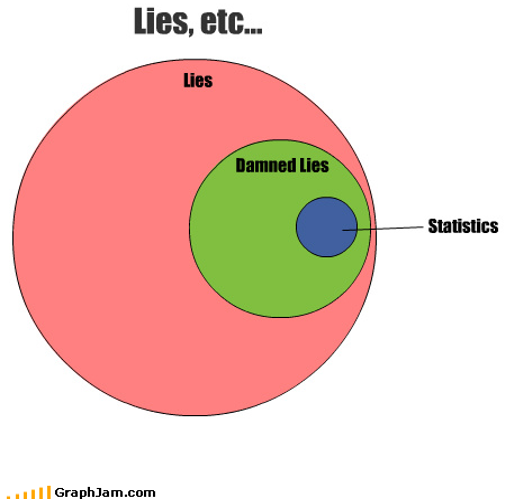 The key is to properly understand who is talking about you and why, and not base decisions on sweeping statistics. *N.B the follower distribution analysis is from Dec 2013, but as Twitter hasn’t grown a huge amount in the last year, it seems reasonable to assume its validity. Happy to share my detailed workings with anyone who’s interested. A survey by Cision has found that time spent using social media for work by the UK journalists who responded has fallen. The focus this finding has received is unfortunate as this reduction may simply be due to increased productivity. Meanwhile, for the first time the same survey found that a majority of UK journalists now think social media use for work is both necessary and beneficial. Cision have produced their annual survey of how journalists are using social media. The top finding is a fall in the proportion of UK journalists using social media for work for four hours or more per day. The level has reduced from 24 per cent in 2012 to 13 per cent in 2014. The inference drawn is that we’ve reached a point of “saturation”, or even decline, in the use of social media by UK journalists. The thing is, time spent is only relevant if you can relate it to a set objective. In this case the reduction in time seems most likely to me to be due to improved productivity in the use of social media by journalists. – According to the survey, Twitter is the No.1 tool used by UK journalists (75 per cent). 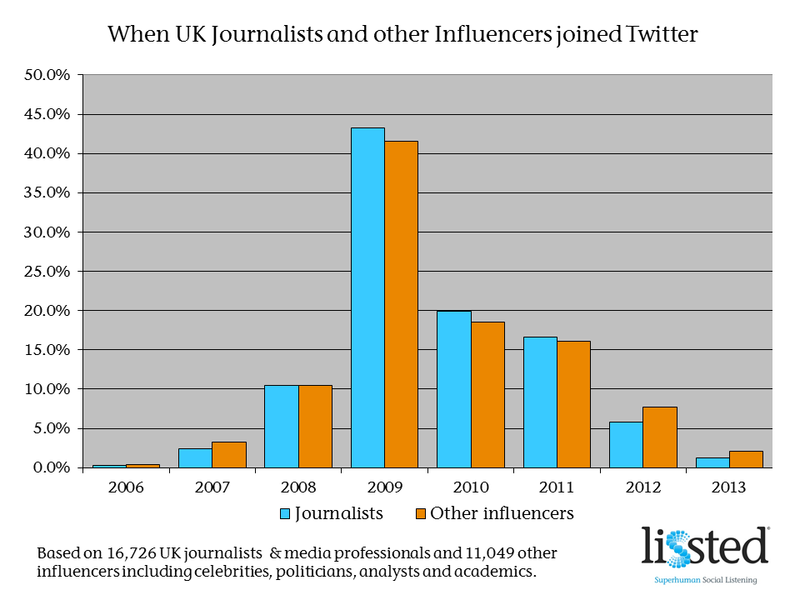 Our analysis of when UK journalists joined Twitter suggests they have had between three and six years to become proficient at it. – Productivity tools are likely to be widely used by now, particularly by those who use social media the most. An example of this is in the survey where it highlights 25% of respondents saying they use Hootsuite. – Knowledge from earlier adopters will have been shared with colleagues who joined later. Journalism.co.uk’s excellent newsrewired conferences are an example (the latest of which was yesterday). – 54% of journalists who responded couldn’t carry out their work without social media (up from 43% in 2013 and 28% in 2012). – 58% say social media has improved their productivity (up from 54% in 2013 and 39% in 2012). If the survey is representative, this means a majority of UK journalists now think that the use of social media for work is both necessary and beneficial. Isn’t this the real story?